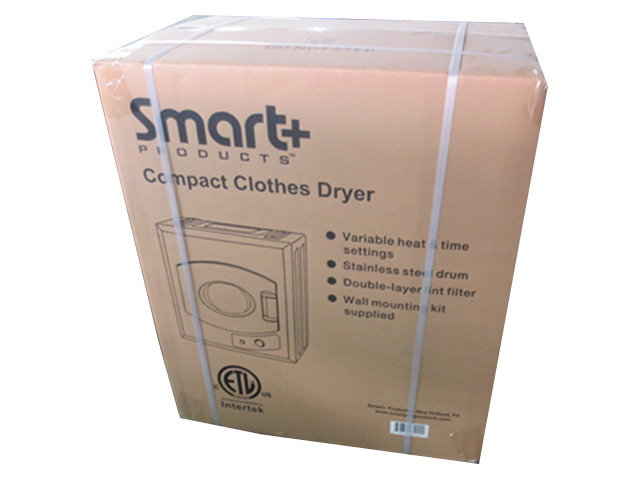 Smart+ Products SPP98D Compact Electric Laundry Dryer 2.65 Cu. 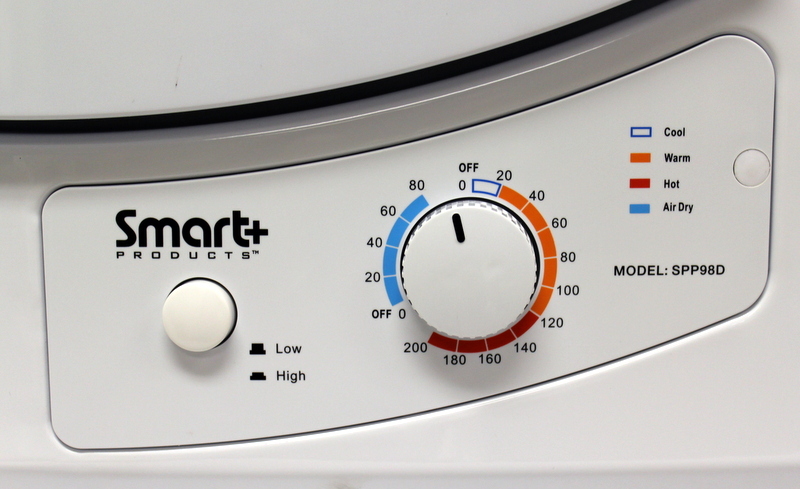 Ft.
Smart+ Products is a manufacturer of innovative and new lines of portable appliance products. They focus on producing high-quality portable appliances that work exceptionally and add a touch of style to your home and lifestyle. 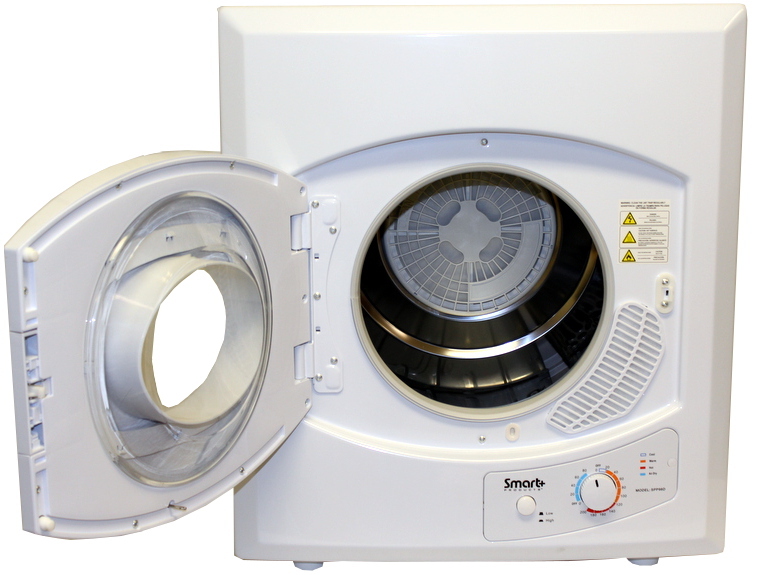 The SPP98D compact electric dryer makes it easy to dry clothes, table linens, sheets and a lot more, without taking up plenty of room – it’s just the right size for small living spaces. Don’t get discouraged by the fact that this dryer is ranked #10; it’s still the tenth best dryer currently on the market. Weight: Unit Weight: 44 lbs; Shipped Weight: 48.5 lbs. Capacity (cu.ft. ): 2.65 cu. ft.
Has a temperature sensor with variable heat settings. 2.65 cu. ft. capacity which is not bad at all for a compact dryer. Uses a standard 3-prong outlet. It’s extremely reliable and fits in a tiny utility closet. A wall hanging bracket is included, making this dryer exceptionally convenient. Great design that increases the effectiveness of the dryer while promoting a balanced tumbling and great performance. Drying Programs: Cool: this function prevents creasing and is used to cool items that have been dried. Anti-wrinkle: this program is used for garments that are difficult to iron, i.e. linen and cotton shirts. Warm: it dries and cools items leaving them wrinkle-free. 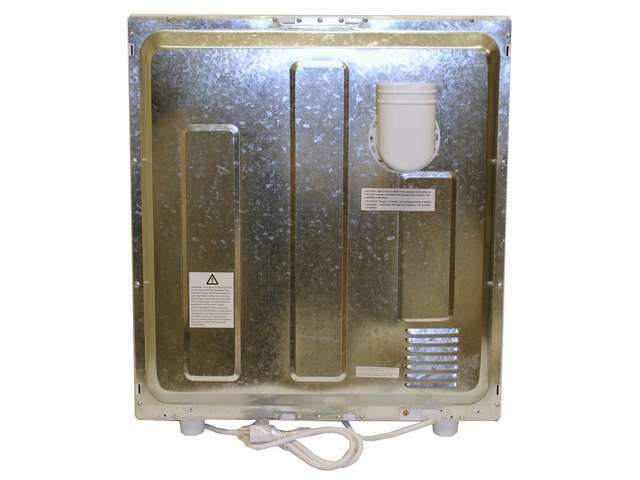 Hot: this program dries large quantities and bulky items. Air Dry: it runs with cool air to air dry garments that need freshening, like clothes that have been stored for a long period of time. Options: High Heat for garments that are particularly bulky and large quantities; Low Heat for delicate items like linen, nylon, silk, etc. It’s the right size for small apartments and condominiums. It’s lightweight, which means you can move the dryer any time you want. A wall hanging bracket is added, making the dryer more convenient. Offers great features and is easy to control. The anti-wrinkle program eliminates the need for ironing. The lack of certain cycles might be drawback for some people. Some dryers might require a major time commitment for servicing or repairing. 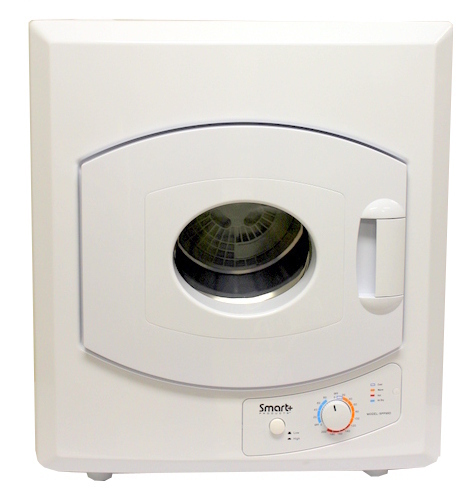 This dryer is the perfect compliment to the portable washer from Smart+. It makes it easy to dry clothes, table linens, sheets and other garments. Although small, it dries more clothes than you think. Like I said, it’s a bit loud when it’s running, so if you’re looking for a dryer that performs quietly, you should look elsewhere. All in all, it’s efficient, easy to use and reliable. Now, it’s not going to win any beauty competitions, but it has great features and options, and it’s not expensive at all.